Note: Updated in June 2018 for clarity and resources. Over the years I’ve witnessed so many Spirit Junkies step into their power and gain the confidence to lead and serve. When this happens, they often feel called to turn their purpose from a side gig or social media hobby into a full-time job. People from all walks of life hear the call. I’ve talked to bankers, publicists, lawyers, teachers and so many more who want to bring spiritual principles into their lives and work, no matter what they do. I’m going to bust those myths in the video below. This video is from a Facebook Live that blew up! It was so popular that I had to share it with you. Clearly people have some money blocks that need to be healed. In this video I share an affirmation that can transform your money story TODAY so that you can attract abundance! Watch now (or keep reading) and begin shifting your money mantra immediately. Do you limit your abundance? Are you blocking your financial ability to receive? Are you blocking abundance? 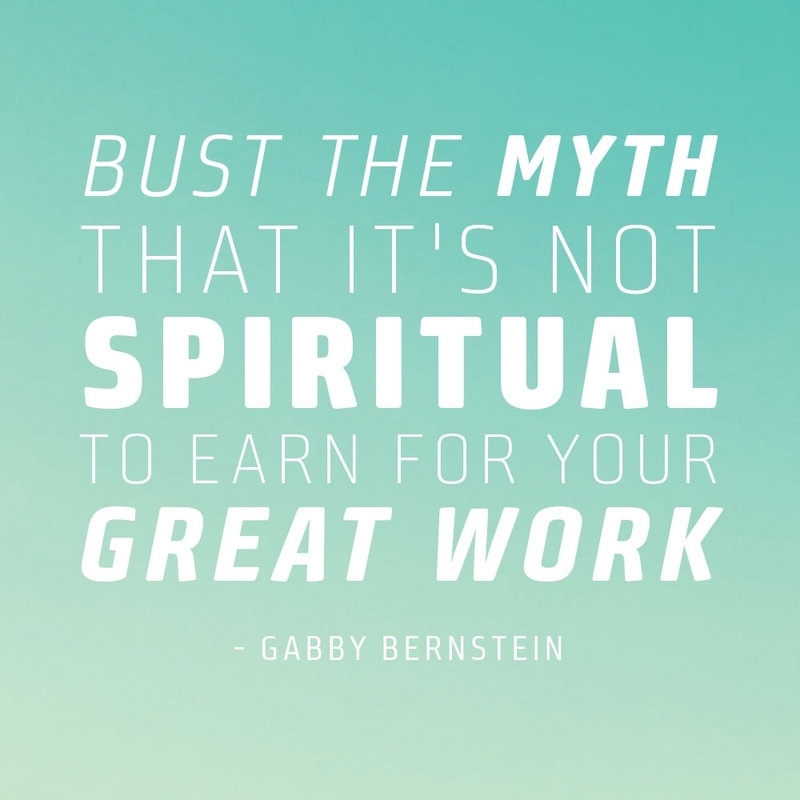 I want to bust the myth that it’s not spiritual to earn for your work. I want to bust the myth that you have to struggle to succeed. Instead, I want to give you a whole new way of perceiving. Many of us have limiting stories and fear-based belief systems. These stories and beliefs often go way back. As young kids we may have picked up limiting beliefs around money from our parents. If you struggled during the recession in the late 2000s, that experience may have become ingrained in your psyche. Here is the truth: Those stories and beliefs are the only reason that you may be blocking abundance or creative earning possibilities. Hold up! That is a very uncreative way of thinking. That limiting belief blocks your abundance. It ensures you will be limited in your earning. But when we start to open up to creative possibilities for earning, that’s when we start to see opportunities we otherwise would miss. We see that there could be potential jobs that may even be beyond what we could imagine, or side projects that could become very abundant in our lives. Or maybe even a different career path that we want to transition into that could create a lot more abundance! The first step in attracting abundance, then, is to see how uncreative your thoughts are. Get fearlessly honest. There is no shame in having uncreative thoughts. It takes courage to take this inventory of your thoughts, so honor yourself for this. Simply answer this question: How uncreative are your thoughts when it comes to your earning capacity? Are you blocking your capacity to earn because you’re a healer or a life coach or a yoga teacher and you feel guilty for earning for the work that you’re doing? You can open up a journal and free-write your answer if you want. Putting pen to paper can bring a lot of clarity. When you are ready to have a perceptual shift around your abundance and your capacity to earn, the first and easiest pathway is to change the language you use! Your words have energy. Your thoughts have energy. Every thought you have and word you utter is an energetic request. And the Universe always respond to your energy by delivering experiences, people and situations that match your energetic vibration. That’s why changing the language you use is so powerful. A mantra is very powerful because it’s short and potent. You can turn to it anytime your thoughts begin detouring into those old, ingrained, fear-based stories. It matters that you truly believe in your money mantra. If you make your mantra, “I will earn a million dollars this year,” and it doesn’t resonate with you or feel authentic, then it won’t work. The key is to start simple. Simply being open to creative possibilities for earning will send a POWERFUL message to the Universe! Write down this mantra. Meditate on it. When you notice yourself going down a fear spiral over money or work, stop your thoughts and begin silently repeating your mantra instead. You’ll notice that simply by repeating this mantra you will feel more at ease. When you use this mantra, you are praying. 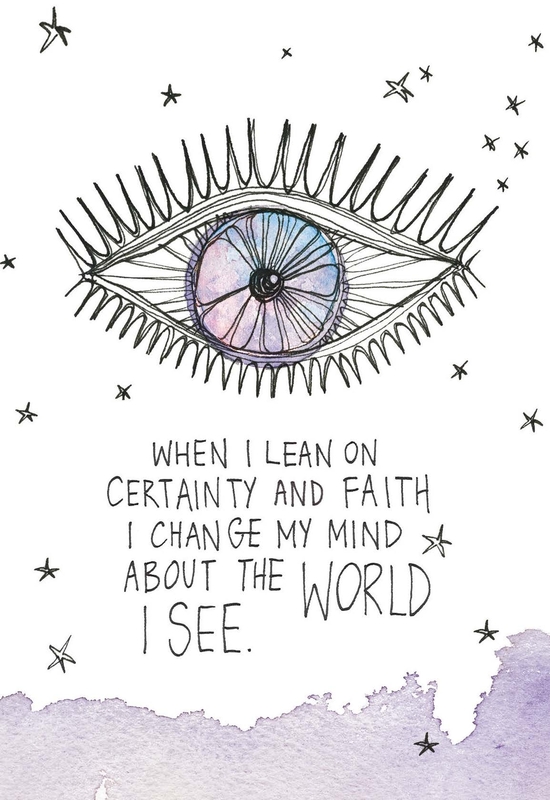 You’re turning over your fears and old beliefs to the care of the Universe and asking to see through loving lenses instead. You’re asking to see with spiritual sight rather than physical sight. The physical sight that we choose to see with limits us. It blocks us. It keeps us small. But when we choose to see with spiritual sight, that’s an inner seeing, it’s an inner knowing. We begin to open up our capacity to become conscious of creative possibilities. When we begin to open up to the creative capacity we have within us, that’s when we begin to open our consciousness to witness the abundance that is around us at all times. You will start to see abundance everywhere. Be consciously grateful for it. It’s not that we need to go out and create abundance or force abundance or make more money or push. We aren’t trying to control anything. Instead, we’re changing the way we perceive our experience of money. We’re changing the way that we perceive our experience of our earning capacity, our receptivity and our worthiness. I hope this practice serves you greatly. Use this mantra and expect miracles. If you’re ready to do what you love and be abundant, join the waitlist for the Spirit Junkie Masterclass Digital Course! This powerful 8-module course helps you gain the confidence and practical tools you need to take action on your dreams. Enrollment opens just once a year, in June. Join the waitlist now and you’ll be the first to know! Thank you, Gabby! I really needed this today! I am aware of my earning potential, but have felt that others don’t believe in me enough to give me a chance. I’ve been looking for a fulfilling job for over two years now, and it’s been difficult. I realize now that I have been internalizing these rejections, and they’ve been holding me back. I have an interview on Wednesday with a company that I really want to work for, and this has given me even more confidence that I can communicate my potential. I’m looking forward to the rest of your trainings! Thanks so much! I love your message in this video – it has been life changing for me. When I read “May Cause Miracles,” the section on finances was a totally new perspective to me. After 7 years in a seemingly dead-end job, the Friday of that same week, I received a job offer at nearly twice my then-current salary. What an instructive, useful video. Thank you, Gabby, for believing so strongly, and for acting on those beliefs. You make us stronger. I loved everything you said. I long to have that declaration, comfirming the support to give my gifts and be abundantly rewarding. I do believe it’s possible for me. I am not understanding your statement of over the last 16 years you have never received a penny. Can you clarify what you mean by that? Does that mean you don’t make any money for what you do at all throughout those 16 years? I may have missed something else in your video, but that stuck out to me. I recently read Spirit Junkies, and am now studying The Course, along with your other two books: May Cause Miracles and Miracles Now. I’ve had The Course for over 13 years on my bookshelf but have never been able to read it as I didn’t understand it at all. UNTIL NOW! Thanks to Spirit Junkies, and your amazing teachings, my life is being transformed one miracle at a time. 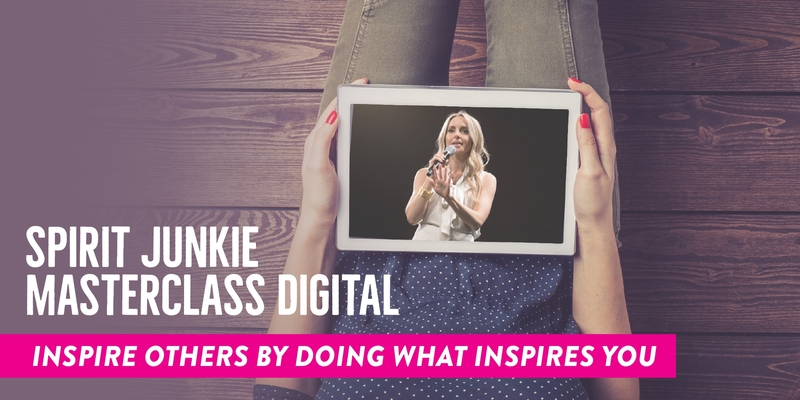 I am about to hit “buy now” on Spirit Junkies Digital Master Class, and I cannot wait to get started. I am so grateful for your presence on this planet, and am inspired by your journey, and the path you walk each and everyday. Deep bow to you, lady! Thank you, Gabby! I’m struggling with the belief that I’m not enough of an “expert” to earn for my work; that I don’t have the credentials. Any suggestions for that block? Loved the video but the link to watch the free training video keeps running me in circles to add my email but not giving me access to the video… I can’t wait to see it! Help please! I often think about the competition!!! This stops me from moving forward. How do you let go of the fear . How do you open to positive thinking? Example … There is enough for everyone. Gabby, I met you this past summer at Wanderlust Stratton. I am inspired and open to creative possibilities of earning for the good work that I do!! XO! Thank you so much for this! I’ve literally been guided to watching this video via youtube which has now lead me to your site. I must say it was definitely what I needed to hear and its inspired me so much. I’ve dedicated today to self-love and care and what is extremely evident to me is how I block myself from creating and getting abundance in all its forms. You’ve really opened my eyes Gabby, you’re an inspirational teacher too! I never knew your story before and knowing you created your business from nothing has ignited passion, creativity and inspiration within me. Cant wait to explore your site some more. I went to the website but it took me to a waitlist page. Is the video you spoke about available anywhere else? Thanks for all you do and for the guidance you provide. You are such a beautiful soul. Hi- I went looking for the video and it took me to a waitlist page as well. We’re both looking for the video that helps us open our creativity to experience abundance, found at spiritjunkies.com/two. Is there another place that it’s still available? When I receive Money from my work, I say mentaly and with my heart to the person who paied me: this you give me, god give to you in doble! Thank you for the video ,i am trying to launch a business and just getting fustrated because I don’t have an followers, I need to reach my audience I know there is a need for what I am publishing .